Our Chinese shareholders get nosy. The annals of Sino-American relations have seen more than a few celebrity-diplomats: Henry Kissinger, a young Richard Holbrooke, and, of course, the current secretary of state. But, unless the record has been lost to history, none has ascended to this rarefied plane of geopolitics while running the Office of Management and Budget. And yet, there was budget director Peter Orszag rushing to a lunch with Chinese bureaucrats on a Monday in late July. To his surprise, when Orszag arrived at the site of the annual U.S.-China Strategic and Economic Dialogue (S&ED), the Chinese didn't dwell on the Wall Street meltdown or the global recession. The bureaucrats at his table mostly wanted to know about health care reform, which Orszag has helped shepherd. "They were intrigued by the most recent legislative developments," Orszag says. "It was like, 'You're fresh from the field, what can you tell us?' "
As it happens, health care is much on the minds of the Chinese these days. Over the last few years, as China has become the world's largest purchaser of Treasury bonds, the government has grown increasingly sophisticated in its understanding of U.S. budget deficits. The issue has become all the more pressing in recent months, as the financial crisis and recession pushed the deficit to record levels. With nearly half of their $2 trillion in foreign currency reserves invested in U.S. bonds alone, the Chinese are understandably concerned about our creditworthiness. And this concern has brought them ineluctably to the issue of health care. "At some point, if you refuse to contain health care costs, you'll go bankrupt," says Andy Xie, a prominent Shanghai-based economist, formerly of Morgan Stanley. "It's widely known among [Chinese] policymakers." Xie himself wrote a much-read piece on the subject in 2007 for Caijing magazine--kind of the Chinese version of Fortune. And so, whereas previous U.S.-China dialogues, which former Bush Treasury secretary Hank Paulson officially launched in 2006, consisted largely of discussions of international issues like trade, currency, and cross-border investment, this year's included conversations about domestic topics like health care and budget discipline. Indeed, the joint announcement that capped two days of talks in Washington actually included a U.S. commitment to "reform its health care system with the aim of controlling rising health care costs for businesses and government . . . [and] reducing the federal budget deficit relative to GDP to a sustainable level by 2013." for the vaguest exhortations. The notion that we might take advice from a developing country--even one as large and rapidly industrializing as China--would have been a blow to our self-image, at least if it weren't so laughable. Within a few short years, though, Washington has come face to face with a daunting new reality: Not only are the Chinese raising questions about our domestic policies, but we suddenly have to listen. "The U.S. had all the answers once upon a time," says a senior administration official. "But China's not the apprentice anymore." To appreciate the complexity of the challenge China poses, it's worth considering one of the country's best-selling books in recent years: a paranoid (and vaguely anti-Semitic) polemic called Currency Wars, written by a dubiously credentialed man named Song Hongbing. Song, who briefly worked a finance job in the United States, alleges that the Western banking establishment hatched the modern financial system in an elaborate plot to dominate the world. Europe fell first, then America. (JFK was assassinated when he tried to resist.) More recently, Japan's lost decade and the Asian financial crisis of the mid-1990s served as warm-up acts for the coming assault on China. Predictably, the Rothschilds occupy the center of the narrative. Victor Shih, an expert on Chinese political economy at Northwestern University, notes that even educated Chinese have been remarkably susceptible to Song's ravings, to say nothing of the man on the street. The book went through ten printings within a year of its publication in 2007, according to the website Chinastakes.com, and today, there are well over half a million copies in print. Tsinghua University, one of the country's premier academic institutions, went so far as to hold a conference on the book's conclusions. No doubt the book's favorable reception derives from China's centuries-old strains of nationalism, xenophobia, and victimhood, mixed with the Communist Party catechism about Western imperialism. "[W]hen you really talk to people, get drunk with them, they let loose," says Shih. “ ‘The American imperialists are still out to get us.' " But some of the suspicions Song exploits are far more rational and mundane. Andy Xie points out that the Chinese had their own experience with large deficits in the 1980s--driven, in part, by health care costs and other generous benefits under the country's "iron rice bowl" system. The country financed the deficits by printing money, which created inflation and debased its currency. Against this backdrop, the ever-pragmatic Chinese have a hard time believing that Americans, faced with over $9 trillion in deficits this coming decade, might not avail themselves of the same option, devastating China's dollar stockpile in the process. The Chinese leadership shares these concerns--perhaps understandably so. Not only is the United States minting truckloads of debt each day, but, in recent months, the Fed has essentially printed money to buy up substantial chunks of it. "In the meetings I've had, they tend to ask me about . . . the Fed's ability to buy Treasuries," says Steve Orlins, a former State Department official and investment banker who now heads the National Committee on U.S.-China Relations. "The Chinese looked at that [and said], ‘There are two buyers: us and the Fed. That's a little scary.' " Chinese officials can be forgiven for worrying, in weaker moments, that the U.S. government is simply playing them for fools--hawking Treasuries whose value we intend to erode by spurring inflation. Even outside the Chinese central bank, senior officials have been sympathetic to Washington's response to the financial crisis, concluding that the alternative--years of economic contraction or subpar growth--would have posed a far bigger threat to their Treasury holdings. In recent months, the Chinese have noted with pride that they had more in common with our response to the crisis than with those of other major economies. On top of which, thanks to the sheer size of their dollar holdings--more than $1.5 trillion at last count--the Chinese don't really have any place to go. There's simply no other asset you can plow a trillion dollars into without either taking an enormous risk, massively driving up the price on yourself, or being unable to cash out portions when you need it. And, of course, if the Chinese were to abruptly stop buying and begin selling, they would almost certainly create a run on Treasury bonds and devastate the rest of their portfolio before they could unload it. No surprise, then, that Chinese Treasury-buying has remained strong even as the deficit has spiked. All of which is to say that, to the extent the administration has a problem with our largest creditor, it may be less with the Chinese leadership than with the Chinese people (the opposite of the dynamic that prevails on issues like human rights). The average Chinese--whether educated or not--looks at his country's swollen coffers and wonders why that $2 trillion in foreign exchange reserves isn't helping to make life easier in China--which, after all, remains a country of enormous privation. More importantly, he's entitled to voice his opinion. Although the Chinese regime is famously quick to stifle political dissent, it tends to allow criticism of the country's economic policies, seeing it as a useful safety valve. Sina.com, a popular web portal. Not even visiting American dignitaries are spared such abuse. When Treasury Secretary Timothy Geithner spoke at Peking University in June, his comment that China's holdings of U.S. Treasury bonds are "very safe" provoked laughter from skeptical students. Perhaps more to the point, the Chinese leadership is highly sensitive to such pressure. "Americans make mistakes when they think that politics don't exist in China, that these guys don't have to pay attention to what the Chinese people are saying," says one Treasury official. "Their room to maneuver is constrained by public opinion." Outside the obvious ways, bureaucratic politics in China isn't so different from its American counterpart. Shih explains that rivals of senior government officials--like prime minister Wen Jiabao, or vice premier Wang Qishan--will often point to the unpopularity of certain economic policies to weaken their standing internally. This can, in turn, prompt the likes of Wen and Wang to signal their bona fides through periodic outbursts--a feature of the Sino-American relationship in recent years that has intensified of late. In March, Wen publicly complained that "we have lent a huge amount of money to the United States. . . . 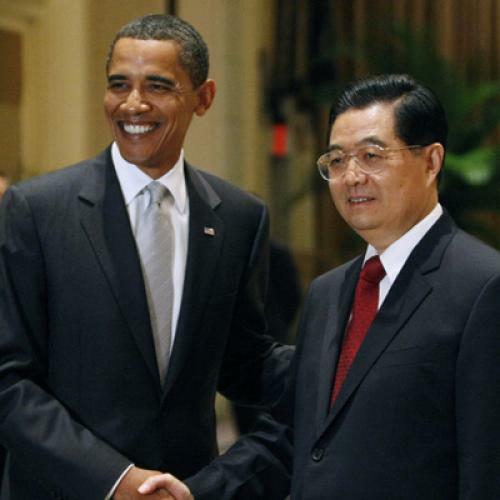 I request the U.S. to maintain its good credit, to honor its promises and to guarantee the safety of China's assets." Then, in late July, in what was either a remarkable coincidence or a statement timed for the S&ED, Wen announced that the Chinese government "should hasten the implementation of our ‘going out' strategy." The mention of the strategy, wherein China would use its dollar stash to fund acquisitions of foreign companies by state-controlled enterprises rather than, say, buy additional Treasuries, raised eyebrows in financial circles. "We've never seen a political leader come out and say that," says Stephen Green, a longtime China watcher at Standard Chartered Bank in Shanghai. To be sure, Green, like at least one Treasury official I spoke with, was skeptical that China could execute such acquisitions quickly enough to make a dent in its dollar holdings. But the mere statement suggests the kind of pressure the regime is under to change its investing habits. Few Treasurysecretaries have come into office better prepared to deal with this delicate political economy than Geithner. His ties to China date back to the summer of 1981, when he studied Chinese at Peking University after his sophomore year of college. This was only a few years after the two countries had established relations, and the Chinese were invariably stunned to see pale-faced Americans strolling through their capital. Their reflex was to point and gawk liberally. Geithner had a trademark technique for approaching the gawkers and striking up conversation: He would bob his head while swaying his hips, shoulders, and fingers--like something out of a Steve Martin sketch on "Saturday Night Live." "It was almost like a wild-and-crazy-guy-type dance move," recalls Justin Rudelson, a close friend from Geithner's Beijing days. "He had a really warm, funny way about him. . . . Within seconds, he'd break through." One minute Geithner would meet an ordinary Chinese person, the next he'd be helping them buy some household appliance at a nearby friendship store, which catered exclusively to foreigners with hard currency. (The alternative for the Chinese was spending months on a waiting list.) In this way, Geithner collected a handful of invitations to Chinese dinner tables, where he'd field-test his Mandarin over a home-cooked meal. Still, the otherworldly weirdness of the experience was sometimes inescapable. On most days, the water in the dorm Rudelson and Geithner shared was ice cold. But, about once a week, the hot water would flow, as if by divine intervention. The first time it happened, the steam from the shower made the bathroom's paint transparent, exposing red Chinese characters that read: "Overthrow the American imperialists and their running dogs." "It was Cultural Revolution rhetoric," Geithner says with a laugh. "The running dog stuff--that stuck." Geithner had been learning Chinese as an undergrad at Dartmouth and ultimately spent two summers in Beijing. After college, he earned a master's in East Asian studies at the Johns Hopkins School of Advanced International Studies, then filled out his China credentials with a stint as a researcher for Henry Kissinger. "He did a number of papers on the relationship between the economic, social, and political structure in making foreign policy in China, Japan, and other Asian countries," Kissinger says. "He had a great analytical mind." These years of apprenticeship help explain why Geithner was eager to keep the China economic portfolio at Treasury, despite Hillary Clinton's initial interest in playing a more prominent role. (The two secretaries amicably resolved the turf question at an early lunch meeting: Economics would stay put at Treasury, but the Strategic Economic Dialogue would become the Strategic and Economic Dialogue, with State presiding over a parallel discussion of security issues.) They also gave him a certain intuition about negotiating with the Chinese. Among his guiding principles, Geithner recently divulged to me, is not presuming to understand China's self-interest better than the Chinese themselves. "It's a ridiculous conceit," he says. "You have to assume they know where their interests lie, and you have to figure out where the constraints are [as a result]--to try to make it compelling to them." In the case of China's Treasury holdings, that means Geithner doesn't waste his breath extolling the virtues of U.S. bonds. Instead, he tries to show that the administration believes it's in our national interest to control the deficit, which should put the realpolitik-oriented Chinese more at ease. "My basic approach is to make sure they understand there's no way they're going to care about this stuff more than we do," Geithner says. Over the last few months, Treasury has focused its efforts on sending this message credibly. In his June speech at Peking University, for example, Geithner highlighted Obama's insistence in his budget rollout that the deficit would have to fall dramatically once the recovery was safely underway--suggesting an alignment between China's interests and the Obama administration's domestic political calculus. The S&ED proceeded in much the same vein: a parade of information and gestures the Chinese could point to when justifying their dollar-reserve policies back home. The key discussion came on the first afternoon, when about a dozen senior officials from each side gathered in a meeting room at the Reagan Building, a few blocks from the White House. Geithner, Orszag, Bernanke, and White House economists Larry Summers and Christina Romer all attended. Bernanke elaborated on how the Fed would scale back its financial-market interventions before inflation became a problem. At one point, Summers helpfully interjected that it's difficult to find an industrialized country that has ever experienced inflation without the economy overheating (that is, producing at more than capacity), something that isn't a concern at the moment. For his part, Orszag gave a slightly more data-heavy version of a presentation he'd given a few days earlier at the Council on Foreign Relations. The bottom line: The recession and the financial crisis explain about two-thirds of the current deficit. "The Chinese side found that interesting and persuasive," says one person who was in the room. "They knew about the stimulus, but I didn't have the impression they were aware that two-thirds of the deficit was . . . related to the crisis." But, all in all, the atmospherics may have been just as important as any particular data point: "To be frank, when you see Peter Orszag, Summers, Christie Romer, Geithner, Bernanke sitting in a room, explaining U.S. economic policy, it's impressive," says this person. Impressive and, in a way, flattering. While the dialogue received minimal coverage in this country, it was a major media event in China. Vice Premier Wang's remarks at a dinner hosted by Orlins' group and the U.S.-China Business Council stressed the mutual respect between the two countries and were carried live by Phoenix Satellite Television, a major Chinese network. One of the photographs that circulated widely in China after the S&ED depicted Bernanke poised on the edge of his seat as Wang hit a point of emphasis. And it wasn't just intellectual displays. On the first night of the dialogue, the State department hosted a lavish banquet in honor of the Chinese in Foggy Bottom's ornate Benjamin Franklin dining room. "The Chinese always roll out the red carpet," says a Treasury aide. "I felt like, on the pageant-meter, we did a good job." One of Hillary Clinton's subtle touches was to surprise the Chinese with a performance by the opera singer Renée Fleming--a friend who "happened to be in town." Fleming became a sensation in China after singing there during the Beijing Olympics. According to one administration official, there was an "audible gasp" from the Chinese in the room when she introduced herself. The reason for all of this is to help the Chinese manage their domestic political needs, not because we fear the Chinese may suddenly start dictating Medicare cuts or income tax hikes. Still, there's at least one potential problem with owing so much money to a strategically critical country: We have a vast range of interests at stake with the Chinese, and the focus on all the money we owe them may, at the margins, deprive us of leverage we need to advance those interests. For example, the administration just decided to impose tariffs on Chinese tires, whose recent surge into this country the U.S. International Trade Commission has ruled a “disruption” that unfairly crowds out domestic producers. * The tariffs are allowed under China’s World Trade Organization agreement, but they have provoked cries of protectionism, and the Chinese appear to be mulling retaliation. At a time when we depend so heavily on the Chinese for low-cost debt financing, the decision must have been more than a little fraught. The same goes for efforts to challenge China’s policy of suppressing its exchange rate so as to make its goods cheap for American consumers. Perhaps even more daunting is the set of critical issues outside the narrower realm of economics. During the S&ED, Clinton conferred at length with the senior Chinese foreign policy official, Dai Bingguo, about such hotspots as Iran, North Korea, and Darfur. Also looming at the dialogue was global warming, on which Chinese cooperation is essential. And, of course, that's miles before you get to internal Chinese matters such as the plight of political dissidents or ethnic minorities like the Uighurs. For its part, Treasury says it doesn't shrink from speaking frankly to the Chinese. Rather, its policy is to raise in private any issue that would be politically difficult for a country to address if it were seen as caving to foreign pressure. As for the strategic questions, say administration officials, the Chinese believe our interests broadly overlap on questions like climate change and nukes. The obstacle here isn't our lack of leverage but bureaucratic politics: It can be maddeningly difficult to get agreement from China's often diffuse decision-makers--a challenge the S&ED mitigates by forcing key players into the same room. Indeed, Clinton was able to ink a "memorandum of understanding" with the Chinese about the future shape of climate-change negotiations. Of course, it's hard to believe that the economic and strategic parts of the relationship never bleed together. The American posture on, say, Taiwan or Tibet clearly rankles the Chinese leadership, and it stands to reason that they'd be less inclined to make economic concessions amid tension over these issues. On the other hand, China scrupulously avoids using its Treasury holdings to air such frustrations. The risk of self-sabotage is simply too great, especially as its pile of Treasuries has grown: Even a couple-percentage-point loss on a trillion-dollar portfolio translates to tens of billions of dollars. Perhaps more interestingly, it turns out there's at least one way the recession has increased our leverage over the Chinese. For years, economists and policymakers around the world have worried about the structural imbalances in the global economy: The major exporting countries in Asia and Europe rely on American consumers to vacuum up their manufactured goods; in order to do that, American consumers have taken on vast quantities of debt. Suffice it to say, any arrangement that relies on a large group of people piling on debt for years on end will necessarily come to tears. But, however much we've pleaded with the Chinese to stop leaning so heavily on American consumers and start leaning more on their own (whose saving rates are extraordinarily high and whose standard of living would improve substantially if they spent more), our efforts have largely been futile. Part of the reason is that such "rebalancing" is incredibly difficult to pull off. The Chinese save such freakish amounts because consumer credit is scarce, insurance is rudimentary, and their social infrastructure is threadbare. They must often pay for houses in cash, and for medical procedures out of pocket. While reform has been on China's agenda for years, the pushback from interest groups can be intense--the country's own ministry of health has been known to sabotage expanded health coverage over parochial objections. Which is to say, absent some powerful impetus, reform is the kind of thing the Chinese always recognize they should do, even seem to want to do at times, but which they never get around to pursuing in earnest. The beauty of the recession, such as it is, is that American nagging on this point no longer has the toothless character of a spousal plea for self-improvement. With imports initially plunging and U.S. saving rates way up, it's a lot easier to make the Chinese believe that the American consumer will no longer save them. "They sort of see the future, and they don't want to be as vulnerable," says Geithner. That leaves the Chinese with little choice but to move ahead on their reform agenda, some of which should benefit Americans by increasing demand for U.S. exports. If nothing else, this would explain the unusual Chinese receptiveness at the S&ED to ideas for boosting domestic demand--such as bank liberalization that would pay depositors a higher interest rate. The day China consumes more, relies less on exports, and accumulates far fewer dollars as a result can't come soon enough. There's a certain mutually-assured-destruction quality to our current relationship--Larry Summers calls it the "balance of financial terror"--in which one false move by either side could bring down both economies, and probably the entire global financial system, too. This makes dialogue a necessity. But what it really does is make you pine for a way back from the edge. As The Atlantic's James Fallows has pointed out, even if both sides behave responsibly, there's the persistent risk of miscalculation--or maybe a rumor that triggers a bond market sell-off China didn't intend. During the cold war, the hotline Kennedy and Khrushchev established was genuinely stabilizing, but it would have been far more stabilizing had the United States and Soviet Union stopped training thousands of nuclear warheads at one another. If, to stick with the analogy, the U.S.­-China relationship is only in the early 1960s, then it's going to be a long couple of decades indeed. *Editor's note: This paragraph has been updated to reflect developments since the original print publication.